The post Why God is not always “nice” appeared first on The Spiritual Scientist. "This... is my classroom," I swung open the metal door and stepped inside. My friend Rukmini followed. We both stood in the sunwashed Middle School English Language Arts room on the second floor of St. Brigid School, the colorful posters that festooned the walls brightening the stillness of an empty classroom. "Wow," Rumini exclaimed. "And this is your room?" "You get to run it how you want?" "Yes, I do," I replied. I grinned and felt a swell of pride. "Here is the library I helped to build! Those are the instructional posters I designed." I gestured to the sunlit trees in the golden afternoon. 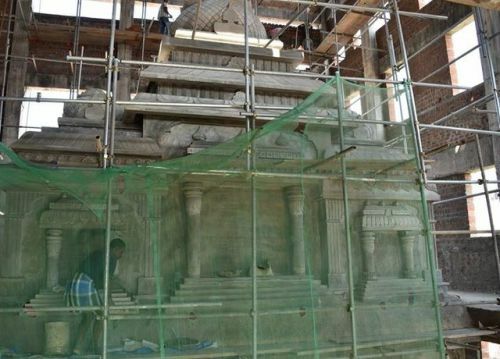 "And out of these windows, you can just see the Prabhupad Tree in the park,"
"Amazing," Rukmini remarked. We both peered through the windows. 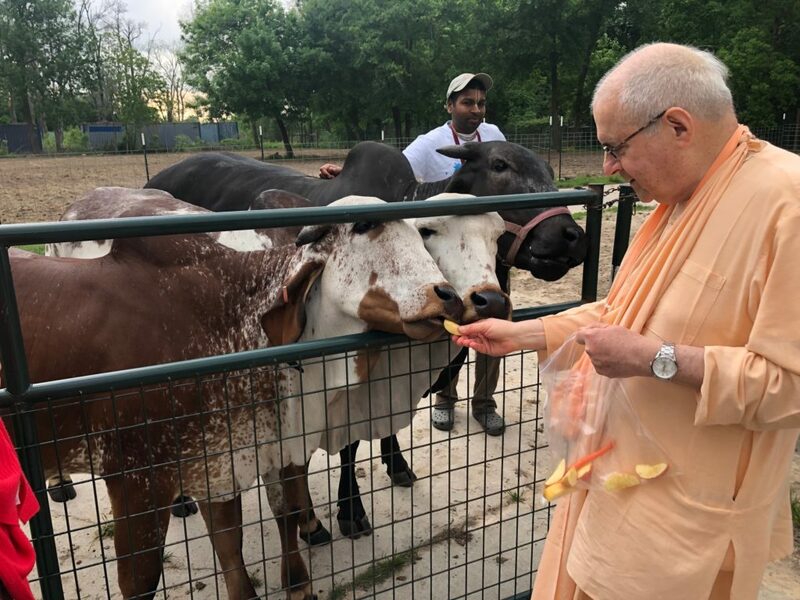 "Indeed, whenever I doubt myself in teaching, I just remind myself of the insanity of the fact that the Prabhupad Tree is outside of my classroom window, that Krishna must have arranged this." In some ways, my spiritual life right now seems to be like the tree in Tompkins Square Park - I can just see it from my classroom window. Distant yet present. This blog is entitled Seed of DEVOTION but the fact is that I have little to share on here regarding reflections on devotion. 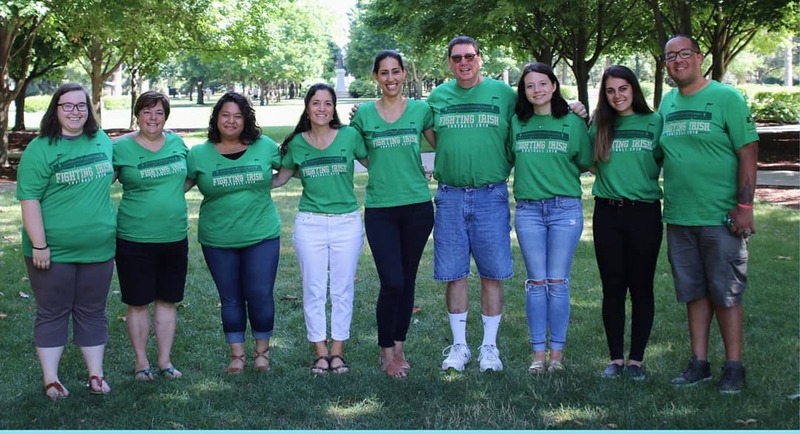 My head rushes with thoughts of persuasive essays and booking field trips and classroom management while my heart hibernates regarding the holy name and spiritual association and service. What can I say? 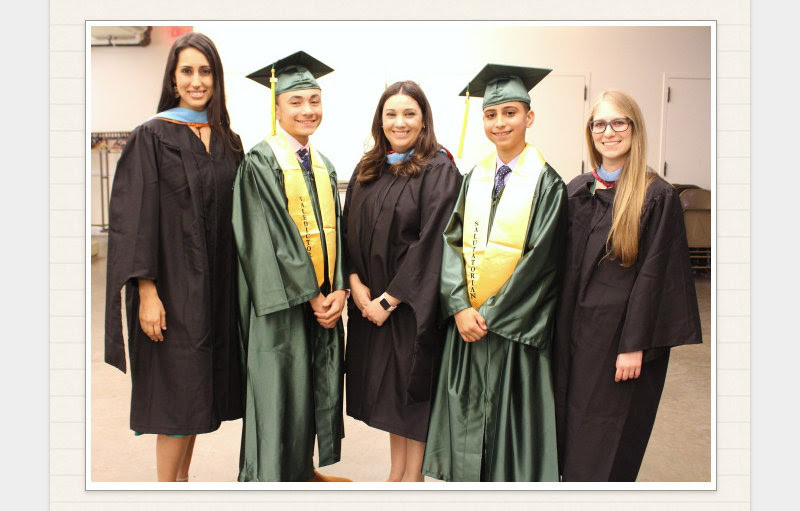 That swell of pride I felt yesterday afternoon to give a tour of my classroom felt golden and powerful. 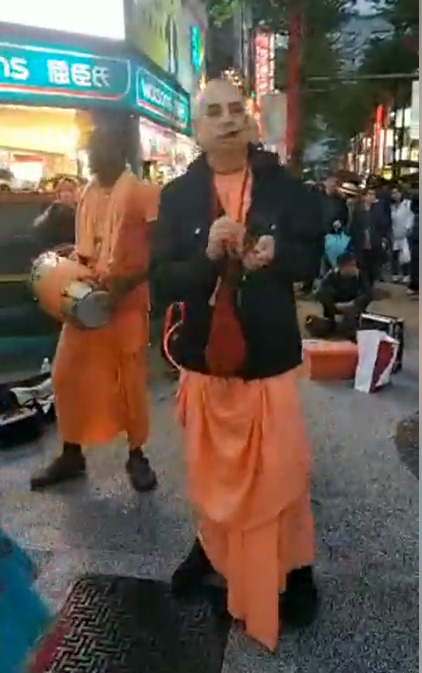 I experienced this sensation that I was making Krishna proud. Like, I am doing my part to refine the gifts that God has given me. Who knows where my life shall go after I finish my Master's degree, Literacy Institute fellowship, and high school teaching internship. I'm excited for what the future holds. I only pray that my heart comes out of hibernation. Braja Vilasa prabhu, the International Fundraising Director of the TOVP, recently paid a visit to the TOVP office in Alachua, Florida. 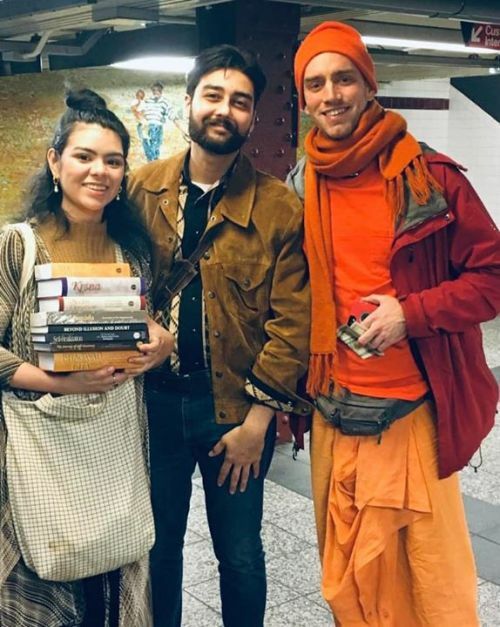 He also arranged to visit three temples in the U.S. with Ambarisa prabhu during that time, and to have some private home programs as arranged by local temple presidents. This ‘tour’, more like a reunion, was meant to provide a progress update and to inspire new donors and encourage previous donors to continue with their pledge payments or begin them if they haven’t started. 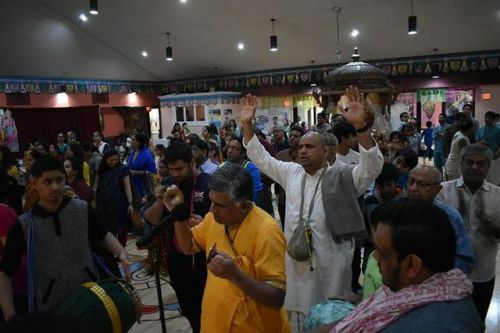 The reception was indeed enthusiastic as we went to the New Orleans, New York and Los Angeles temples, meeting devotees who were happy to see us again, and getting to know many new devotees we missed on the last visit in 2015. All in all, we were very pleased to bring good news to everyone about the progress of the TOVP and the scheduled Grand Opening in 2022. We received numerous payments towards pledges already made and many, many new pledges for Pillars of Devotion, Bricks and Coins. 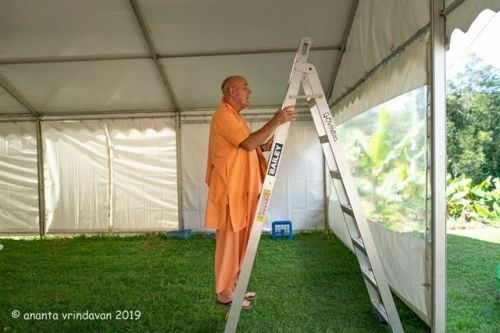 The MISSION 22 MARATHON continues in full force and is sweeping up all devotees into the nectar of the TOVP yajna. 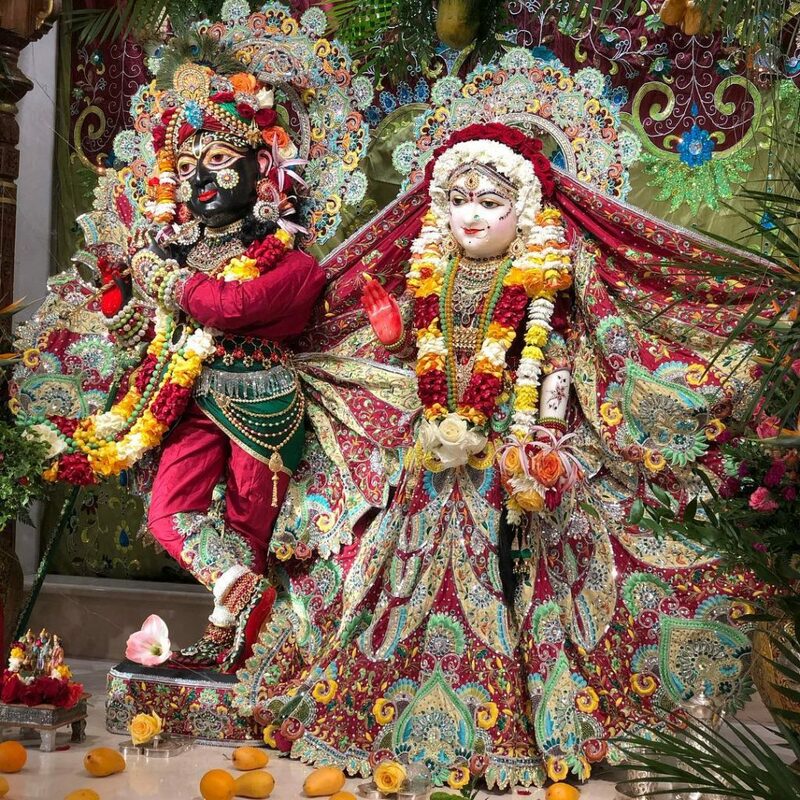 The post Ambarisa and Braja Vilasa Prabhus Visit Three U.S. Temples appeared first on Temple of the Vedic Planetarium. 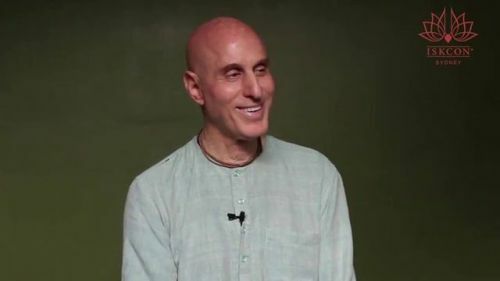 "Philosoph(ies) of Education" and includes a call for papers and volunteers from ISKCON educators/devotees worldwide. 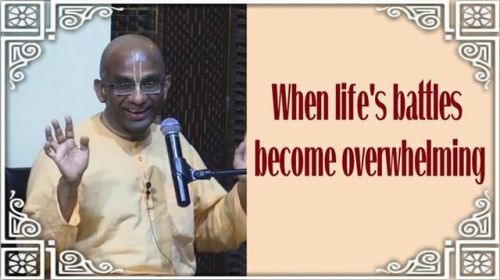 Giriraj Swami read and spoke from Srimad Bhagavatam 2.7.23. 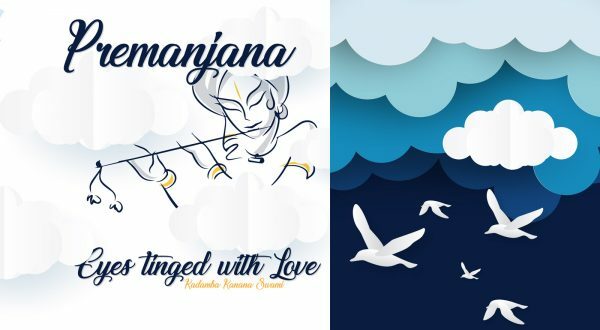 Solution: Adorn your ears with the sweet mellows of Premanjana, the latest release in the illustrious repertoire of Kadamba Kanana Swami. Is his last album still in your car on repeat? Are you still singing those melodies at full throttle in the shower? Do you wake up with its heart-lifting mantra in your head? If not, then it is definitely for you! “One who’s eyes are open sees everything with love”. 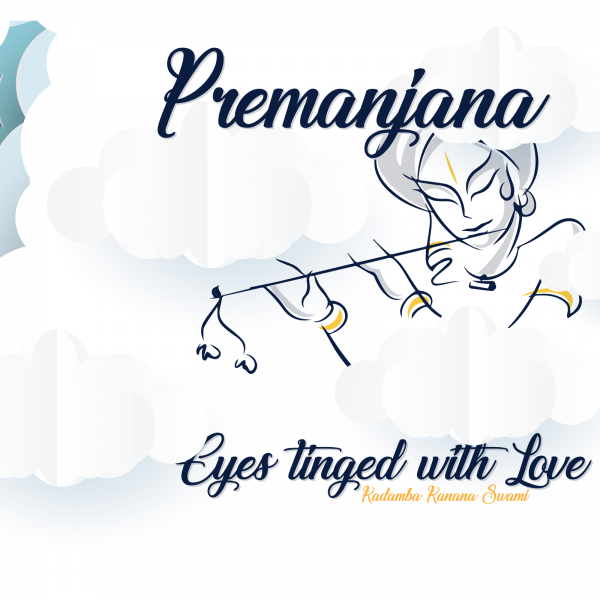 Premanjana is a soul-investment that promises to keep our eyes (and ears) wide open! For those on the other side of the world, you can contact Param Brahma or Taravali (Melbourne) to get your copy! 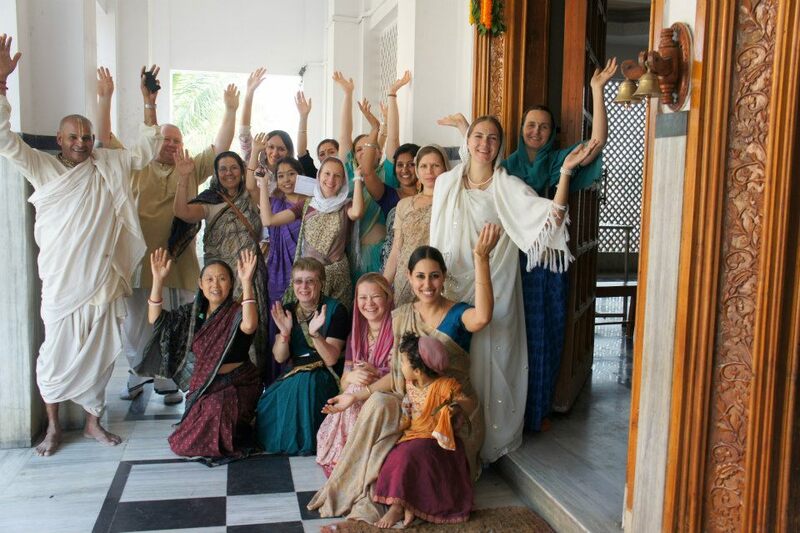 Chorus: Thando, Bhavisya, Gaia, Madreya, Vraja Krsna, Jaya Kesavi, Monique, Indukanti, Medha Gauri. 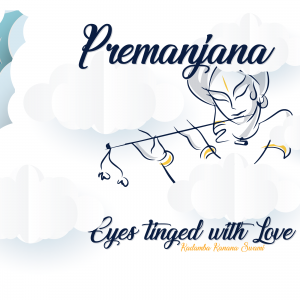 The article " Premanjana – Eyes Tinged with Love " was published on KKSBlog. The post Inner Change – 3 reasons why changing ourselves is tough and 6 ways to make it easier appeared first on The Spiritual Scientist. 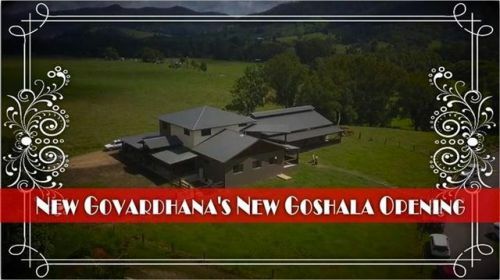 The post HH Jayapataka Swami 70th Vyasapuja Celebrations! 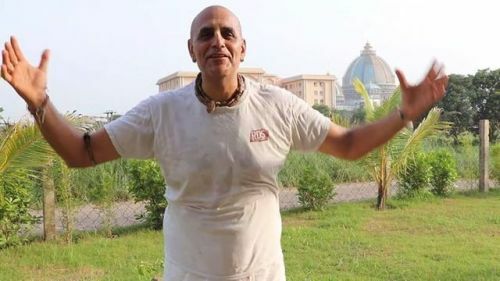 appeared first on Mayapur.com. The post Victory flag hoisted in Mayapur! 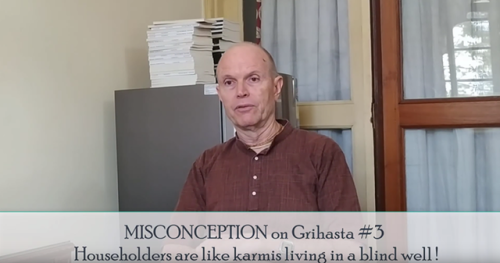 appeared first on Mayapur.com. 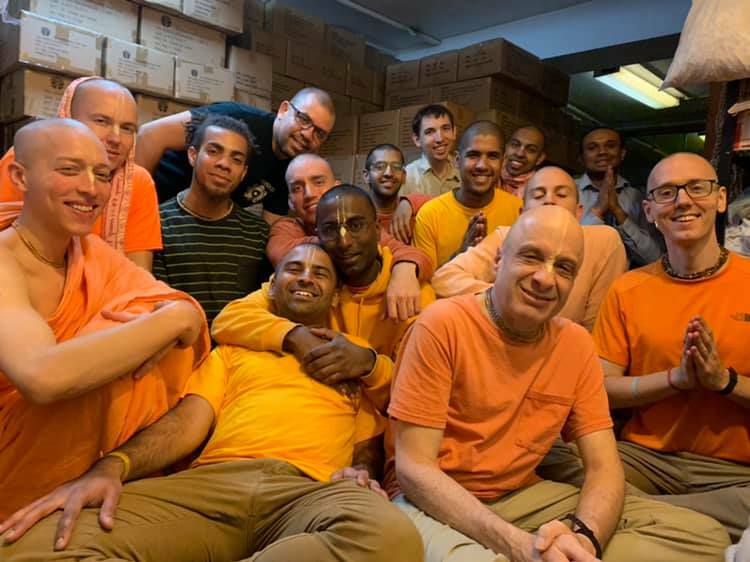 New Shipment of Srila Prabhupada's books arrived today at the Yuga Dharma ashram. 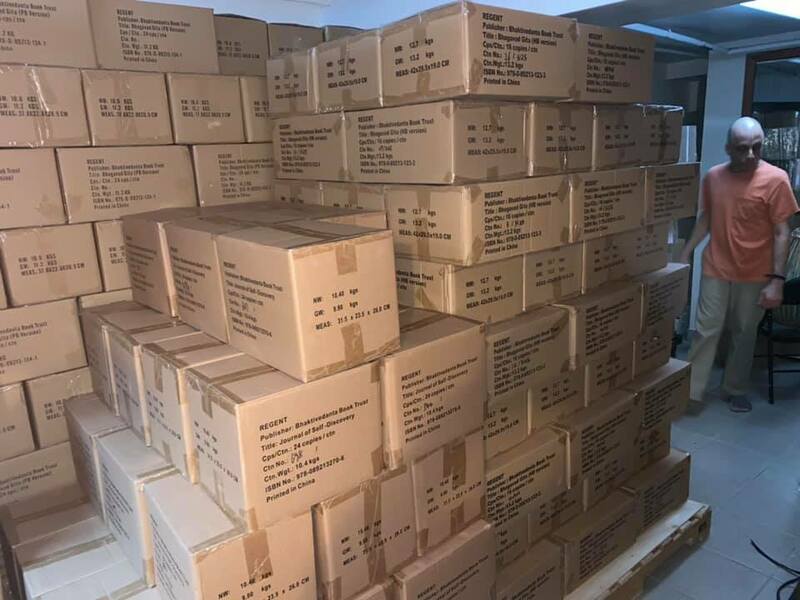 Total of 732 boxes, biggest order for North east USA since 1981. 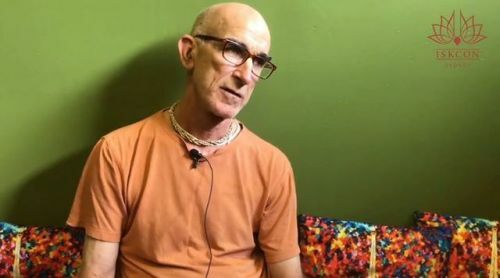 He said there are those who are looking after the marketplace, those who are supplying the marketplace, and there are personalities who look after different marketplaces and sometimes come to supply that marketplace with fresh inspiration. Then he describes that he was just the sweeper of the marketplace, which is not a simple thing. It is very interesting to look at Srila Bhaktivinoda Thakura as the sweeper of the market place. Of course, in India, the sweeper was considered a fallen occupation, so he was taking a very humble position. But it was not just a statement without cognitive meaning. No, because Bhaktivinoda Thakura was the sweeper of the marketplace of the holy name and that was his service to Lord Nityananda. 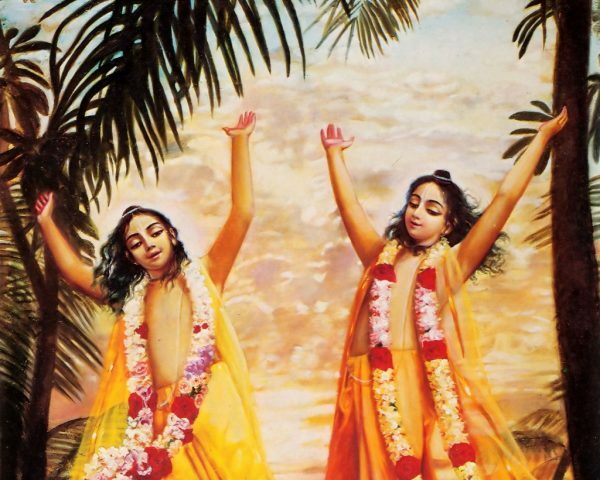 The marketplace of the holy name had originally been established by Nityananda. 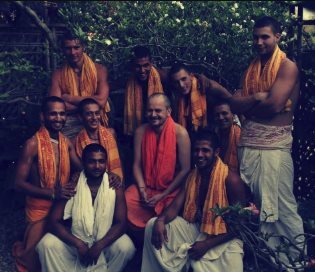 When Lord Caitanya sent Lord Nityananda to West Bengal , a whole group of devotees went with him, and it wasn’t easy to go. 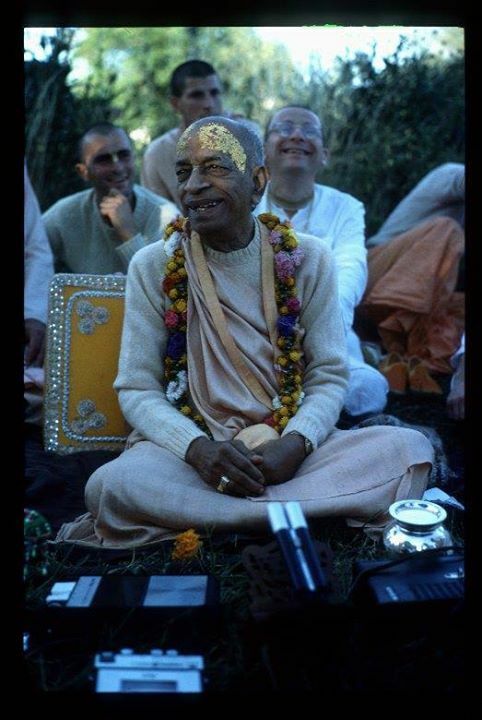 Because they were so ecstatic and so overwhelmed by ecstatic kirtana, they missed all the turns! 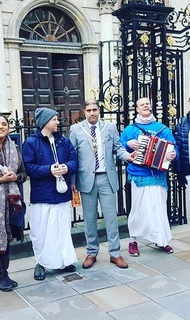 But eventually they got there only by desire and the mercy of Mahaprabhu,and when they reached, there was so much ecstasy that it was just amazing. 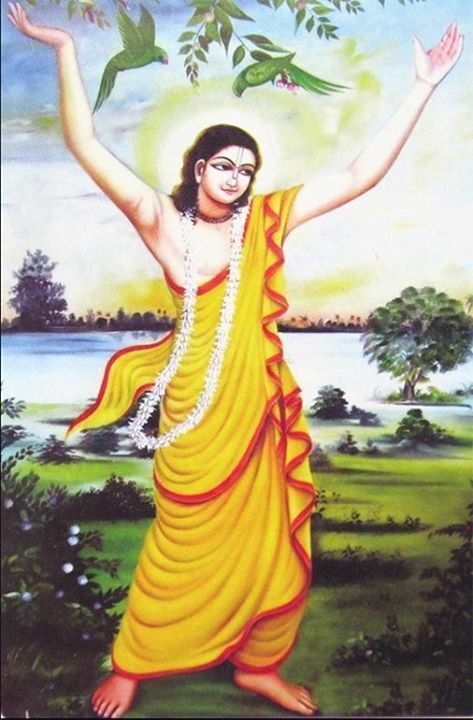 It was with this ecstasy that Nityananda brought the holy name to West Bengal and engaged people in kirtana. 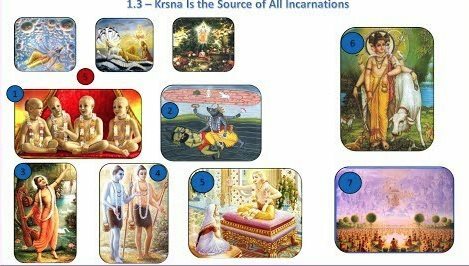 He created the marketplace of the holy name, so originally it was Lord Nityananda who started the namahatta and since then it has been taken around the world. Our mission is to engage people in devotional service. A little service, and when a little service is done, there will be more service, because that is the nature of devotional service – it changes the heart. 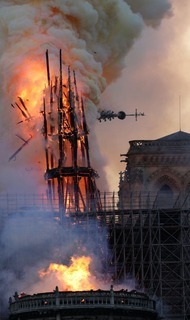 The article " The Marketplace of the Holy Name " was published on KKSBlog. What You Have To Do If You Have Offended A Devotee Of The Lord. 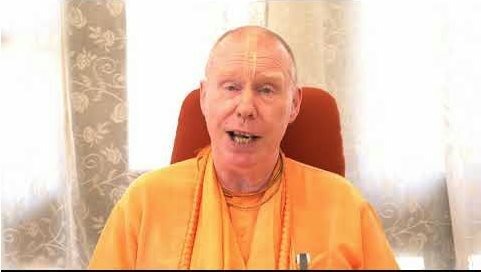 In other words, if you have offended a Vaisnava, do not simply continue with your life as if nothing had happened. Turn around 180 degrees! Make up for your bad behavior. Repent, ask for forgiveness and offer some service. Be real, honestly, feel that your behavior was not good at all. A person cannot forgive you from the heart if they do not see that you have actually understood what had gone wrong. The river of forgiveness needs a certain slope in order to flow; this slope is understanding and admitting the mistake you have made. 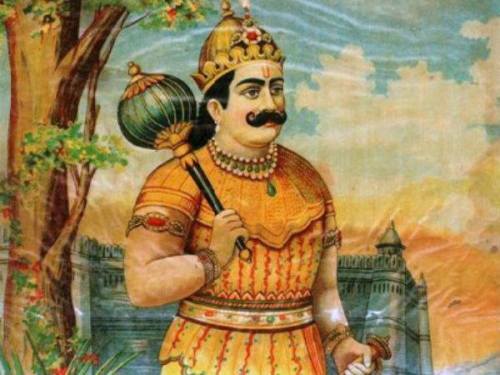 The dynasty of Maharaja Raghu is glorified because Lord Ramacandra appeared in that family. Lord Ramacandra appeared in the Iksvaku, or Raghu dynasty. He became King during Treta-yuga, but because of His good government, the age was like Satya-yuga. Lord Ramacandra exemplifies an incarnation of Godhead who descends for the mission of paritranaya sadhunam vinasaya ca duskrtam – protecting the devotees and destroying the miscreants. 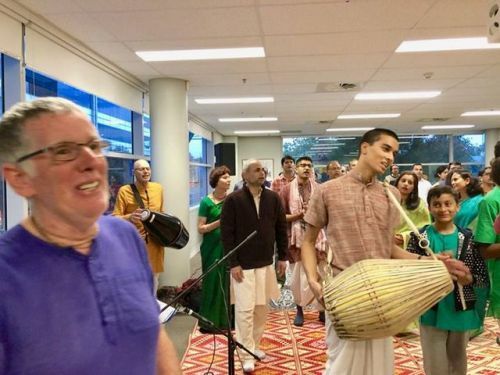 This year, the devotees from Canberra invited me to attend their Rama Navami celebration, which took place in a rented hall down town that gave more space for the function. It was a great program with puspa-abhiseka, kirtan, lecture and feast. 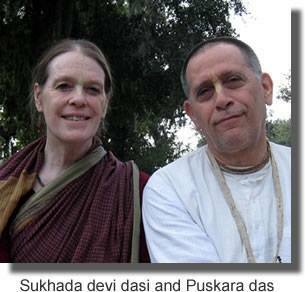 by Sukhada devi dasi and Puskara das. As I drive up to the Alachua Temple, I take in the beautiful grounds with newly planted trees, fresh flowers, and a well-maintained temple. I enter the Temple, pay my obeisances, gaze at the beautiful forms of our Lords, praying that They bless me and my family throughout the day with Their remembrance. They’re so merciful, exquisitely dressed, and the devotees marvel and discuss Their beauty when the curtains open for Guru Puja. I appreciate the fact that guests are well-received and cultivated nicely. I take darshan of the Deities. I wish I could help with the Sunday feast, but unfortunately, I’m short on time. It’s a little frustrating as there are so many activities at the Temple, and I’d love to participate in every one of them; but that, of course, is impossible. They were so happy to take the set with them. Krishna’s mercy. 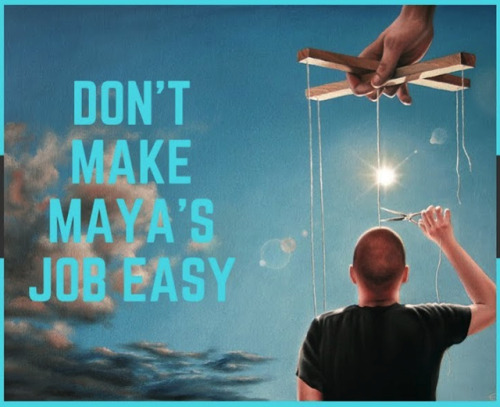 The post Rama Navmi class – How Rama’s selflessness decreases others’ distress appeared first on The Spiritual Scientist. 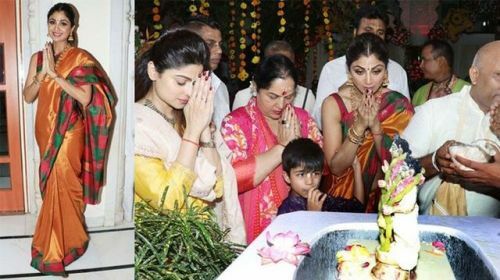 Lord Krishna’s devotee and Bollywood celebrity Shilpa Shetty, accompanied by her family, visited recently Iskcon Juhu temple. They all worshipped Lord Krishna at the temple and sought His blessings showing thus a wonderful example to her followers and fans. Bhimasena’s reminder to his brother we all need to remember. When Dharmaraja Yudhishthira was ruling over Indraprastha, one day a brahmana came to meet him. 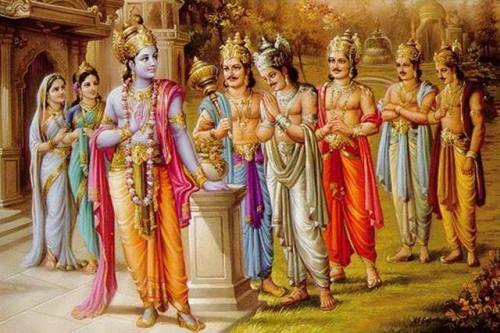 He met Dharmaraja and then returned home. As the brahmana was going out of the main gate, Bhimasena saw him. He saw the brahmana while going in also, but he did not talk to the brahmana because it was usual for several people to come and seek from Dharmaraja what they wanted. But this brahmana did not appear to have received anything from his elder brother. So Bhimasena asked him, “Sir, you are returning empty handed. Have you met my brother? The Toronto Hare Krishna Temple! Trying to reach a state of equilibrium….